Dice all the different vegetables exactly in cubes 3/32? (2mm) on each face.Preparation and cooking of the lamb:1. Separate the cloves of garlic and blanch them 3 times before peeling in 3 separate baths of boiling water. Peel and remove thin green core then reblanch three more times each in a separte bath of boiling water. Purée in food processor to a very smooth consistency and add a little milk. 2. Meanwhile, dress correctly the leg of lamb removing the membranes, then brown slightly all over in a large pan with a little olive oil on a hot flame approx. 5 minutes. 3. 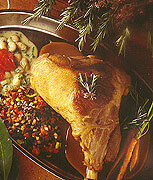 Then place the lamb in a preheated oven at 450ºF (230ºC) and bake approx. 50 minutes depending on preference and size of leg of lamb. When finished, remove the lamb and let it sit for 15 minutes. Remove the fat from the pan and add a little water. Set aside.Preparation of the vegetables:1. To cook the "Tarbais" or white beans, first wash and clean the beans. Then place them in a pan with the onion, carrot and bouquet garni. Cover with water and cook for 2 hours on a very gentle simmer. Salt only at the end of cooking. When finished, drain, set aside and keep hot. 2. Ratatouille: individually sweat the finely diced vegetables listed above in olive oil. Then put them all in a frying pan to finish cooking and season to taste. Set aside keeping warm.Final Assembly of the Plate:1. Heat up the lamb in the oven. 2. Thicken the juices of the lamb with some of the garlic purée. 3. Finely julienne the leaves of the parsley and put them on the beans then reheat them. Also reheat the ratatouille. 4. Slice the lamb and place on plate. Add the vegetables and serve. All rights reserved peter d'aprix ©1985-2015.